Insight into the world of Horse Racing, Pace Figures, Form Cycle Patterns and gambling using an analytical perspective with Predicteform.com's GM, Paul Bessire, alongside site co-founder and horse owner Dan Zucker, and former sports radio host, Jimmy Shapiro. How will your horse run today? Predicteform.com knows. 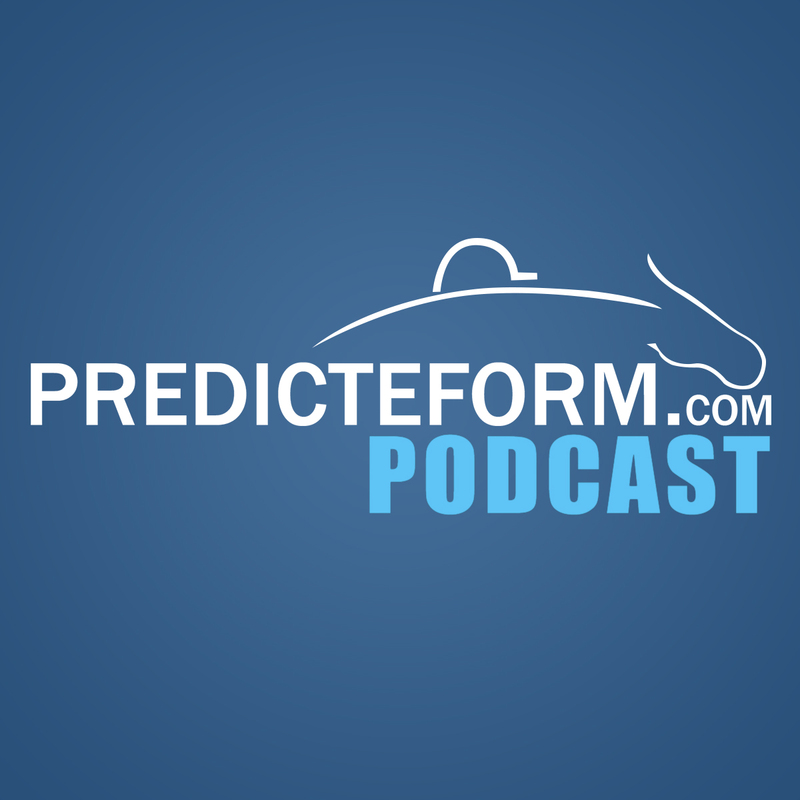 Predicteform co-founder Dan Zucker and Brisnet's Ed DeRosa & PredictionMachine.com's discuss the upcoming Three Pack: the 2016 Santa Anita Handicap, the 2016 San Felipe Stakes, and the 2016 Tampa Bay Stakes. Dan Zucker and Ed DeRosa dig into the Grade I Clark Handicap which features Breeders' Cup Classic Runner Up, Effinex and fourth place finisher - Keen Ice. Can we expect a regression or forward progress from these two heavy hitters. Predicteform co-founder Dan Zucker and Brisnet's Ed DeRosa introduce Predicteform.com's Race Finder technology. The Race Finder is the first fully transparent results driven database for horse racing. Powered by the Pace Figures and Value Plays, the Results Finder let’s you see the results by Value Play type of specific criteria you select including: total starters, average odds, number of wins, WIN %, WIN ROI, ITM (in the money) % and show ROI. Predicteform co-founder Dan Zucker speaks with Fiona Craig, breeding advisor for Moyglare Stud, one of the leading international racing stables. Fiona's knowledge of the European invaders in the Breeders' Cup Turf Mile and Breeders' Cup Turk at 12 furlongs is intelligent and insightful. Predicteform co-founder Dan Zucker and Brisnet's Ed DeRosa & PredictionMachine.com's discuss the Breeders' Cup Distaff, a race missing its division's biggest star but one that figures to have a say in the three-year-old filly championship. The Distaff anchors the Friday, October 30, Breeders' Cup card at Keeneland Race Course. Brisnet’s Ed DeRosa and Predicteform co-founder Danny Zucker discuss the strategy and approach to handicapping the 2015 Breeders' Cup Challenge Weekend. Brisnet’s Ed DeRosa and Predicteform co-founder Danny Zucker discuss the strategy and approach to handicapping the 2015 Whitney Stakes. Brisnet’s Ed DeRosa and Predicteform co-founder Danny Zucker discuss the strategy and approach to handicapping the 2015 Haskell Stakes. PredictionMachine.com created a sister website focusing on Horse Racing called Predicteform.com. GM of Predicteform.com Paul Bessire, co-founder of Predicteform.com Dan Zucker, and former sports radio host Jimmy Shapiro, preview the 2015 Belmont Stakes and American Pharoah's quest to become the first horse to win the Triple Crown since 1978. Brisnet’s Ed DeRosa and Predicteform co-founder Danny Zucker discuss the strategy and approach to handicapping the 2015 Travers Stakes which includes Triple Crown Winner American Pharoah. GM of Predicteform.com Paul Bessire, co-founder of Predicteform.com Dan Zucker, and former sports radio host Jimmy Shapiro, preview the 2015 Preakness Stakes. GM of Predicteform.com Paul Bessire, co-founder of Predicteform.com Dan Zucker, and former sports radio host Jimmy Shapiro, preview the 2015 Kentucky Derby. Predicteform.com's Dan Zucker speaks to legendary clocker Gary Young about his impressions of the workout of the Kentucky Derby favorite, American Pharoah. Predicteform's Dan Zucker recaps the four horses that have a shot in the Risen Star Stakes. GM of Predicteform.com Paul Bessire, co-founder of Predicteform.com Dan Zucker, and former sports radio host Jimmy Shapiro, preview the 2014 Belmont Stakes. GM of Predicteform.com Paul Bessire, co-founder of Predicteform.com Dan Zucker, and former sports radio host Jimmy Shapiro, preview the 2014 Preakness Stakes. GM of Predicteform.com Paul Bessire, co-founder of Predicteform.com Dan Zucker, and former sports radio host Jimmy Shapiro, preview the 2014 Kentucky Derby. Predicteform co-founder Dan Zucker along with Brisnet's Ed DeRosa discuss the top stakes races in the country for that weekend. This lively podcast includes an in-depth Pace Figure and Form Cycle anaysis. Check back weekly for new podcasts.